Leprosy is a slowly progressing condition which maims and cripples patients. It is said to be as old as Mankind. It is caused by the Leper Bacillus which is also called Hansen Bacillus. It is a strictly human medical condition with cutaneous, mucosal and associated nerve lesions which are responsible for paralyses, sensory losses and mutilations of limb extremities. In all colonies the Colonial Medical Corps had to face the disease but its most successful achievements took place in Sub Saharan Africa, which was a major region of endemicity. In the early days of the fight against this scourge the name of Marchoux* (1862-1943) stands above all others, when as early as 1923 he spoke in favour of humanizing Lepers Hospitals. He suggested the building of a Leprosy Research Centre which opened up in Bamako and became later named after him. It is presently be known as the "Marchoux Institute". 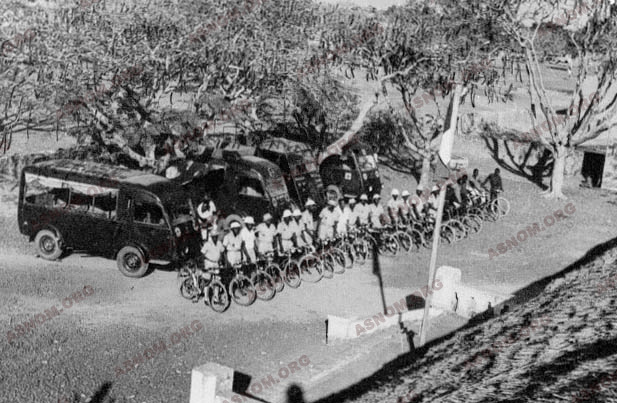 In 1944 the fight against Leprosy was re-organised in order to achieve a better coordination. For their part Colonial Corps Surgeons with Carayon* and Bourrel* innovated and developed surgical procedures which intended to bring some relief to patients. Now in Africa supranational organisms (OCCGE and OCEAC) carry on the fight against Leprosy with the help of physicians of the involved nations. WHO coordinates the fight and every country of endemicity runs its own program which is financed through charities. This condition is expected to gradually subside with poly-chemotherapy regimens which are now put in place and implemented with the hope that this disease will not be any longer a concern for public health. China and India are probably the most ancient focuses of the disease which made its way after to Mesopotamia and to the Mediterranean shores and then spread easily across the Roman Empire. It peaked in Europe during the twelfth century just after the Crusades and declined after. Segregation of patients who were isolated in lazarets in order to minimize contagion are possible explanations for this decline but the most likely reason is probably found in the advances of hygiene standards. During the nineteenth century Virchow and Hansen with their works reported important relevant pathological and bacteriological data. In the early twentieth century Mitsuda supplied the first immunological information and developed an invaluable intra-dermic test. Today this condition holds on to the tropical world. Its main strongholds are located in Africa, in Central and South America and in the Far East. Protein deficiency, promiscuity, the lack of hygiene, ignorance combined all together with the immuno-depressive action of many medical conditions contribute to its upholding. From a worldwide distribution during the Middle Ages, Leprosy has now turned into a specifically tropical disease. Lepromatous variety (on the left). Leprosy spots. Tuberculoid variety (on the right). In France the few hundreds cases which are known are all imported ones and no native case has been reported now for decades. Over the last thirty years the number of lepers has been dropping from thirty millions to less than one million people the world over but two or three million of them remain disabled even if their disease is cured. This uniquely human condition which develops over a long period of time is due to a bacillus which was discovered in 1873 by a Norwegian named Hansen. The slow development of this micro-organism explains why the disease breaks out several years only after contamination. Even after it breaks out the disease develops slowly. Worsening developments are followed by respites which can sometimes extend over several years. Most of the time this disease constitutes a chronic and crippling condition but it is not directly responsible for the death of the patient. For each case the way of contamination remains unclear. Most of the time it dates back to childhood while inhaling sputters of an infectious leper. It can also occur with a leper's mucus tainting skin ulcers or an open wounds and with the use of soiled items such as linen, mats or pillows. All these possible ways of transmission entail close and durable contacts such as the ones which occur in the close settings of family life. There is no known hereditary transmission but congenital transmission remains possible. As fleas, mosquitoes and other insects are entailed in the transmission of other tropical diseases Marchoux* with the help of Bourret* started contemplating the hypothetical but possible role of an insect, but this was to no avail except for the occasional and exceptional case of domestic flies passively carrying the pathogen.
) which may constitute an impediment for the economic development of a country". Native populations stuck to their forebears' traditions with the building of segregation villages and the French authorities followed suit. A plan of action against leprosy was laid out and included on the one hand setting up lepers hospitals and "agriculture settlements" and on the other hand restricting patients movements and barring them from some occupations. But it did not take long for physicians to behold that villages were kept empty at daytime as patients were begging in villages which were all around so that enforcing segregation was only a fiction. At the turn of the century some Public Health Supervisors such as Kermorgant* in 1905 and Grall* in 1910 made several comprehensive reports on leprosy. - In Indochina the illness had been present there for a long time and was rife everywhere but distribution of the cases was uneven with two main focuses :Tonkin and Cochin-china. According to counts made by colonial physicians around 1900 there were several hundred patients in Laos and Cambodia but they acknowledged that these numbers made only for a small part of the total figure as most of the time those who were included were the ones who had reached an advanced stage of the disease. Tonkin with its overpopulated delta was a very active region. Many lepers were hiding but their number was assessed to be around five thousand in Cochin-china and about a thousand in Annam. In 1912 Governor Sarraut set up a Department of Lepers Hospitals.
.) is probably inferior to the real one. Great efforts are still to be made to screen and segregate new cases". - In Africa Bernard* who had the support of Dabbadie*, the Public Health Director of the time, assessed that several thousands lepers were living in the Upper Volta and added that many patients kept hiding out to avoid being segregated. In 1955 after conducting a thorough screening of entire populations the Major Endemic Diseases Control System gave a ratio of two hundred patients for every ten thousand people. For the whole continent their number was figured to be above five million with one million of them living in French speaking Africa. 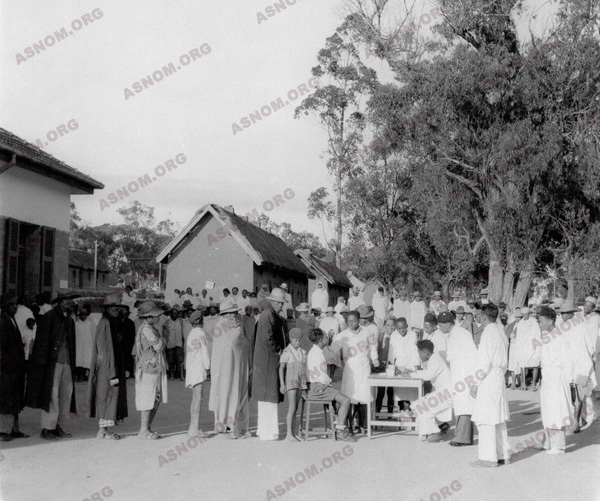 In 1939 eighteen hundred patients were recorded in the French Trading Posts of India. There was a few hundred of them in Martinique also where Montestruc* reorganised the fight against the illness and committed himself also to the study of leprosy characteristics in infants and children. At the same time in French Guiana, Floch beefed up the plan of action against leprosy where this condition had already been reported in 1887 by Simond* with his doctoral dissertation on the issue. In summary Leprosy was present in every part of the French Colonial Empire and was a real cause of concern. No efficacious medication was available before the time of sulfones around nineteen fifty. As soon as a patient had been diagnosed and identified he had either to hide out or to be deported to a facility for the care of lepers or to a village for lepers. Depending on their ethnic group and culture, patients could be accepted or repelled from their communities with no mercy. Cutaneous lesions break out on the skin of young adults consisting in discoloured or bronzed spots on dark skins or slightly reddish ones on light coloured skins. The edge of the lesions is more or less marked and distinct. According the patient's defence reactions specific clinical aspects develop later from this first lesion which is called "the undetermined one". This was made accurately clear by J. Languillon* in the early nineteen sixties and then by Ridley and Jopling. 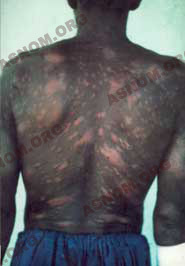 Whenever the patient's resistance is strong and stable, he develops the so-called Tuberculoid Leprosy with characteristic cutaneous and nerve lesions. This leprous neuritis strikes preferentially some nerves such as those of the cervical plexus, and also the ulvar and median nerves, and the external popliteal nerve. 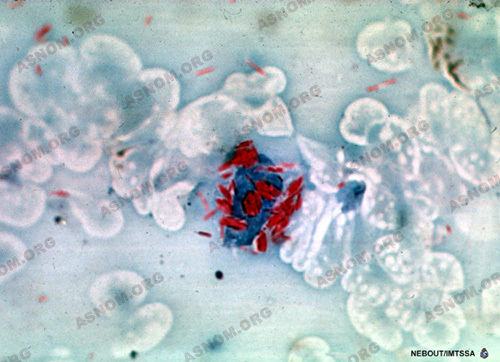 This neuritis results in paralyses and in an impaired trophicity. Bacilli are scarce and found clasped into dense inflammatory tissues and the patient is not contagious. 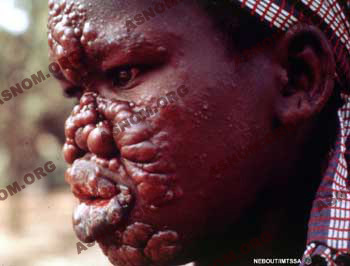 With an individual who has no resistance, a special variety occurs which is called Lepromatous Leper. 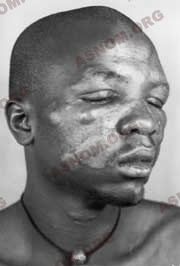 The patient displays infiltrated cutaneous lesions called "lepromas". Neurological disorders are unobtrusive and there are frequent visceral lesions. Bacilli are easily found and the patient is contagious. Between these two well characterized varieties ,there is a wide range of others which are named "intermediate varieties" because of unstable and fluctuating defence reactions. - Multi-bacillary varieties which include lepromatous and intermediate forms. - Paucibacillary forms which fit mostly with the tuberculoid variety. Quarantine of all lepers was recommended by the "French Tropical Medicine Society" in Paris when it got started (in 1909) as this was considered as one the most basic measures which had to be taken to secure prevention. This had already been required by the first International Leprosy Conventions. During the proceedings Marchoux*, but to no avail, had expressed his reservations. The instructions were to record the patients' numbers and to segregate them after. The "native legal code" provided a term of imprisonment for those who did not report to mandatory screening for endemic diseases. Tropical Leper Hospitals had a poor reputation : these facilities which had low standards of hygiene and no efficacious medications were considered as places where to die in spite of the dedication of the nurses who were in charge (mostly in Indochina) and who belonged to religious orders. Still these facilities aroused envy among a few people who tried to be illegally admitted there. In 1923 the Third International Leprosy Convention opened up in Strasbourg with Marchoux* as its General Secretary. He advocated the cause of lepers and rose up against rounding up patients in special villages. With slowly changing attitudes, coercive segregation was abandoned while leper hospitals kept on running and ambulatory treatment became standard practice with the use of chaulmoogra oil. In Bamako, lepers who had been kept in seclusion in Djikoroni were set free by Laigret* who incited them to report on a regularly basis to the outpatient clinic in order to carry on their treatment. The same was done in all other territories. But at this point of time, some patients were still in the need of living in lepers communities where they could be treated. Today, there are still some "therapeutic villages" but now there is absolutely no coercion, such as in Lambarene for the one A. Schweitzer set up in 1953, and for one close to Bouake Raffier* built in 1963, and another built in Samanko close to the Marchoux Institute by Languillon* in 1966. Most severe cases wish to remain in their community with their relatives close to them while having medical and surgical care and being fitted with a prosthesis when they need one. They are free and they volunteer to live in these villages which nevertheless have lost today most of their relevance with the implementation of poly-chemotherapy. In December 1930 "The Leprosy Special Society" of the Society of Nations convened in Bangkok. Internationalizing the fight against leprosy was on the agenda with the implementation of the same rules of action and with deciding upon consensual and standard therapeutic procedures. A worldwide network of Research Centers was designed with four cities which had already their own centre : Calcutta in India, Culion in the Philippine Islands, Honolulu in Hawai and Rio de Janeiro in Brazil. Tokyo also in was on its way to have its own. The determination of Marchoux* who had the backing of F. Sorel* convinced the French government to have a Central Institute for Leprosy built which was renamed "Institut Marchoux" after his death in 1945. In January 1932 at the Ministry of Colonies in Paris a "Consultative Commission for Leprosy Prophylaxis" was set up and Marchoux became its president. - And a training and specializing centre for healthcare personnel. The institute was in charge of setting up, of standardizing and coordinating all actions taken against leprosy in French sub Saharan Africa. In fact the Institute did not remain in charge of these duties over a long period of time, as they were transferred to the SGHMP when chemotherapy became available. It is only in the early nineteen fifties after sulfones had started to be widely used that screenings became really efficacious and in the meantime leprosy endemism started to decline. This decline became quite spectacular with the introduction of poly-chemotherapy. We are indebted for the development of these protocols to the teams of health-workers working at the Marchoux Institute led successively by Laviron*, Kerbastard*, Languillon* and Saint André*. Within forty years the lepers ratio dropped from 200/10 000 to 5/10 000 people. In the meantime eight hundred thousand patients have been diagnosed and treated by the Colonial Medical Corps. The need for coordinating the fight against leprosy became of utmost importance at the level of each federation of colonies. It was not achieved before making a series of trials. In 1931 the Leprosy Prophylactic Service of French Western Africa was set up in Bamako. It was assigned the duty of compiling a register of patients and of treating them while monitoring the outcome of their treatment. In fact, each colony, part of the federations, had its own Health Service which was independent from the others and the directives of the local Supervisor had to be implemented there, so that there was no possible coordination yet. In 1939 the Autonomous General Service against Sleeping Sickness (SGAMS) was set up. As a federal service which was independent from the government of each colony. It typified beforehand what an institution had to be like for the needs of coordinating the action against a transmittable disease. In 1945 SGAMS became SGHMP which became in charge of organizing the fight against leprosy on the field of action outside of Dakar and Yaounde. The Marchoux Institute and its research centre which was carrying out therapeutic trials and training of personnel was incorporated to this new institution. In 1953 with the availability of sulfones in French Equatorial Africa, and later in 1955 in French Western Africa Richet* breathed new life into the screening and the therapeutic plans as he got an important support from international organizations such as WHO, UNICEF, FISE, FIDES, and also from humanitarian organizations which were brought together in the International Federation of Associations against Leprosy. Two of them had a preponderant role in the former French colonies : the Order of Malta which subsidised the Applied Leprosy Research Institute in Dakar and also the Raoul Follereau Foundation which among other programs, subsidised the Marchoux Institute. At Richet's* and Labusquiere's* instigation an original framework was set up in 1956 which was an application of Jamot's* doctrine : "daisy-shaped rounds " were put in place with assistant nurses who had to ride a few dozen miles on their bicycle each day along a petal shaped round for the distribution of sulfone tablets. They also updated patients' records, and referred to the physician they had to report to any suspected new case they had come across. Detection and treatment of hundreds of thousand patients has been made possible with this arrangement. From 1945 to 1960 most of the fight against Leprosy has been carried out by physicians of the Colonial Medical Corps who were assigned to this duty when they were at the head of districts of the SGHMP and later after 1960 by national physicians who gradually took over. A most remarkable national framework was set up in Ivory Coast by Maurice Rive* and in the Upper Volta by Labusquiere*. But insufficient or irregular intakes of sulfones resulted in outbreaks of resistance to sulfones which was diagnosed in 1964 and this became a major impediment. But with the development of some other major medications leprosy started to lose ground with a scarcity of contagious cases and with the bacteriological sterilization of lesions. This happened together with the improvement of hygiene and living standards. By the time these countries had won their independence, they understood that their fight against major endemic diseases with leprosy among them, had to be a common undertaking which led to the creation of the OCCGE and the OCEAC. As a complement to medical therapy, surgery for leprosy which has sometimes to be followed by physical therapy and prosthesis fitting can prevent many paralyses from being irreversible and can bring down the number of disabilities related to leprosy neuritis. During a long period of time surgeons performed only ulceration cleaning procedures and amputated infected or necrotizing extremities. - On the one hand curative procedures such as the ones for progressing neuritis in association with medical therapy. They consist either in draining inter-fascicular leprous abscesses or in a procedure named neurolysis which releases all intra or peri-fascicular inflammatory adherences. In 1953 Lassiera was the first who attempted to perform such decompression procedures which were later in 1957 refined by Carayon* and are now known as "fascicular neurolysis". - On the other hand palliative procedures aiming to offset the consequences of paralyses. In 1953, with Carayon*, the foot extensor muscles revival procedure took over the foot arthrodesis procedure which had been so far standard practice. But it is mostly about hand paralyses that surgeons strove to imagine more and more surgical procedures. In 1958 Languillon* had a surgical department for leprosy set up at the Marchoux Institute where Bourrel* had most of these repairing procedures streamlined, improved and codified in order to make them feasible by "general surgeons" working in district hospitals or by surgeons who had been commissioned to get there on temporary assignment. In 1997 WHO endorsed this strategy with the publication of "Surgical Procedures for Leprosy in district hospitals". - Rifampicine which has been used since 1968 is an exceptionally efficacious medication with bactericide properties. As it is an expensive medication it has to be taken under close supervision. - Clofazimine which has been used since 1972 is a non toxic molecule which comes at a high cost. 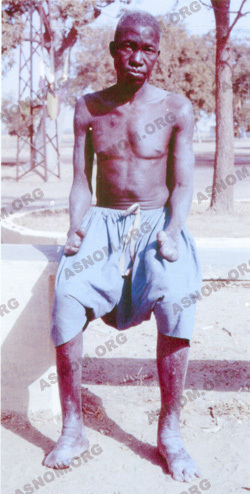 - Thalidomide which is used to control some varieties of leprosy reactions. Therapeutic plans and duration of treatment courses have been completely changed. Poly-chemotherapy has really disrupted the development of this condition as transmission of the disease is prevented by a swift sterilization of the existing lesions. Paucibacillary varieties undergo a six month long treatment course and multibacillary leprosy has to be treated over a two year long period of time. Healing is now the usual outcome but disabilities which were already present by the time the therapeutic course was started, such as paralyses, trophic disorders, plantar ulcers and stumps remain and this underscores the need for having patients cared for as soon as possible. WHO 's objective is to achieve the elimination of leprosy as a public health issue. This will happen with a ratio of patients lower than one for ten thousand people. In fact eighty percent of all Lepers who are recorded across the world, are found in these only five countries namely Nigeria, India, Myanmar, Indonesia, and Brazil. Around the world, six to seven hundred thousand patients are diagnosed each year. There are still hundreds of thousand disabled lepers who are in the need of surgical care. International aid which is supplied among others by the Raoul Follereau Foundation and by the Malta Order Hospital Charities, makes that the situation is swiftly improving. Public Health authorities should keep on striving and researchers should look forward to developing new and more efficacious medications and one can dream also of having someday an efficacious vaccine. In the meantime watching out for any potential resurgence of the disease is imperative and disabilities have to be mended or made up for. As far as Leprosy and some other medical conditions are concerned, the expertise of the Colonial Medical Corps is fully acknowledged by international organizations. Sansarricq* was appointed to the head of the Leprosy Department at the WHO headquarters with the charge of designing the outlines of poly-chemotherapy regimens for leprosy, while Daumerie* an other former colonial medical officer is in charge of supervising the WHO program against leprosy. - Beaudimont A. et Laviron P. : La lèpre. in Médecine tropicale p. 1395 M. Vaucel 1954 Flammarion et Cie Edit. - Joyeux Ch. et Sicé A. : La lèpre. in Précis de médecine coloniale p.540 Masson et Cie Edit. 1937. - Bourrel P. : Chirurgie de la lèpre chez l'africain. Expérience personnelle de 580 interventions. Med. Trop. 1969,29,1-32. - Bourrel P. : Place de la chirurgie dans la prévention et le traitement des infirmités lépreuses. in Précis de léprologie Languillon . p 251-279. Pré-presse Pastel-Créations,1999, Lavaur. - Carayon A. : Les névrites lépreuses. 1 vol. Masson Edit. 1986 Paris. - Languillon J. : Précis de lèprologie 1 vol. 1999 Lavaur. - Sansarricq H. : La lèpre 1 vol. Ellipses 1995 Paris.